Building on ongoing bottom-up actions, best practices and contemporary experiences of four National Infrastructure Agencies that are considered frontrunners in the development and application of asset management in their networks governance, it will deliver the first ever common European asset management framework approach that enables consistent and coherent cross-asset, cross-modal and cross-border decision making. The overall Concept, its major conceptual elements and the targeted results are depicted in the figure below. 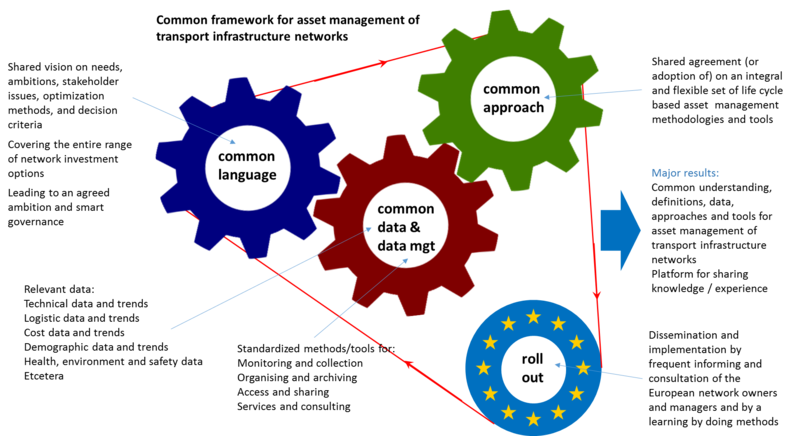 The envisioned common framework comprises 3 major elements: common language, common data and data management, and common approach represented as three separate cogwheels. 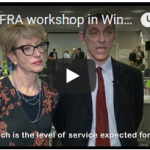 These three cogwheel elements need to be aligned and in place to make the framework operational and to enable the roll out to network owners and assist managers in Europe. Common language. The stakeholders (owners, managers and service providers) will be provided with a common set of principles, definitions and key performance indicators (e.g. on reliability, availability, maintainability and safety) in order to support them in their efforts to optimize their transport networks. The common language enables them to communicate, learn and coordinate consistently and maximize effectiveness and efficiency of investments and related decision making. The common language provides guidance to determine fit for purpose strategic policy goals, network service level agreements and asset performance levels. Common data and data management. The stakeholders (owners, managers and service providers) will be provided with meaningful standards for cross-European information management (which data, how to use it, and how to translate it into the required information). It enables them to derive to an European information management model supporting their tasks to be executed interoperable across modes and across borders. Common approach. The stakeholders (owners, managers and service providers) will be provided with meaningful criteria to quantify performance, risk and life cycle cost building on a coherent set of common methodologies to balance life cycle performance, risk and cost on network and asset level. This in turn will enable them to manage their complex network systems under changing demands and requirements. Together these three elements form the (flexible) common framework that can be implemented by the National Infrastructure Authorities (NIAs) in their chosen actions. In order to support the Roll out of the common framework in the NIAs organisations, replication, dissemination and communication activitites will be unfold.